Hi guys has any of the members got computer experience and thought of making a blakes 7 based game ?? I was work on a game once about 15 years ago but the guy with the programming knowledge backed out and as I was doing the graphics couldn't carry on but the role playing book was giving me loads of ideas was a shame and I've always waited a blakes 7 game part space combat the rest role play and skill advancement , anyone out the working on anything now ?? 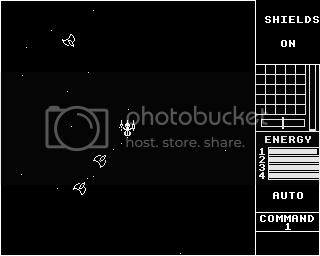 Thanks PS for posting the Starship Command screenshot. I thought I'd post some pictures from a couple of other B7 games. Programmed by Johnny Wood (with help from Jason Slater, Kerry Bates, Matthew Kopelke and Travis Phelan). This game let you explore the Liberator, fly around the galaxy, fight pursuit ships, and teleport to other planets. The Liberator deckplan was based on the Horizon technical manual, meaning it is suitably large but also easy to get lost in. Work on the game seems to have ceased around 2001. Although all the mechanics were in place the storyline had yet to be implemented, leaving this as a bit of fun for a playaround but without any lasting purpose. @pmwuk - I'd very much like to know who you are and if you're one of the people who provided graphics for the game. I still have the source code and all of the game assets, though it's all a bit dated now. @Joe Dredd - Did you create the animated .gif? If so, do you still have the version of the game that included the Vila demo? I didn't use a revision control system back then, and I'm afraid that version of the game is lost forever. Yes, I created the animated gif of your game. I'm sure I saved two versions that you released. One is evidently the Vila demo so if you'd like a copy please let me know and I'll hunt around for it. I put the animated gif up on the forum as part of an exercise to find more examples of B7 computer games. Lastly there was a name-unknown game written for the Macintosh way back when. Getting slightly off topic there's been a Liberator flightdeck flythrough called 'B7 Bridge', by extremecheese. A number of B7 ships, guns and bracelets are available as Sketchup files. A friendly genius by the name of skororu created a sumptuous Liberator flightdeck in CGI using Blender (I think). It can be found on deviantart.com. The other one was a Spectrum game. Does anyone know where I can download Snare? I rather enjoy text adventure games. I'll dig it up for you G4I. What platform do you want it for? Well, I'm running a Kindle Fire HD at the moment. But I can bust out my Windows 7 laptop for it. Many thanks Johnny, I look forward to checking out what there is of Liberation. Does anyone have a copy of 'Snare' the Blakes 7 text game? I used to love text adventures by the Infocom company. They had a magnificent vocabulary and understood so many words. A classic is 'The Hitchhikers Guide To the Galaxy', but games like 'A mind forever voyaging' and 'Bureaucracy'(another Douglas Adams text adventure not many know of). I believe the actual code used to generate those games is now available as a free download to generate your own games with if anyone has some great Blakes 7 stories they would like to turn into adventure games. Oh, for those having trouble running the older DOS based games, simply download 'DosBox' for your platform and you can run practically all of them. What I love about this emulator is that it supports the Gravis Ultrasound(used to own one, it was a revolutionary sound card for it's time). I have not tried it with 64bit OS's yet but it works perfectly on all 32bit OS's up to Win7. I definitely have it and will post a link soon. The game is platform-independent, so you can run it under Windows, Linux, Mac, Android etc. As you say it's based on the z-machine, which was a brilliant idea by Infocom, back when there were a zillion home computer platforms. Instead of having to translate every game to 30 odd platforms every time they wrote a new one (IBM version, Apple version, C64 version, Acorn version...etc) they programmed the game to run on the (theoretical) "z-machine". They then created an emulator for every platform (so the IBM pretended to be a z-machine, the Apples pretended to be z-machines, etc), allowing the games to run on those computers. And that meant that for every new game they wrote, they already had a system in place so they'd work on all those other machines they needed to market to. Anyway, back on topic... I was trying to find out if there is a z-machine emulator/interpretor for the Kindle Fire that G4I mentioned, then got sidetracked by work. I'm not really familiar with the Kindle but on the positive side it seems to be an Android-based system (and there are Android z-machine interpretors) but a modified/locked out system (in which case they probably don't work). 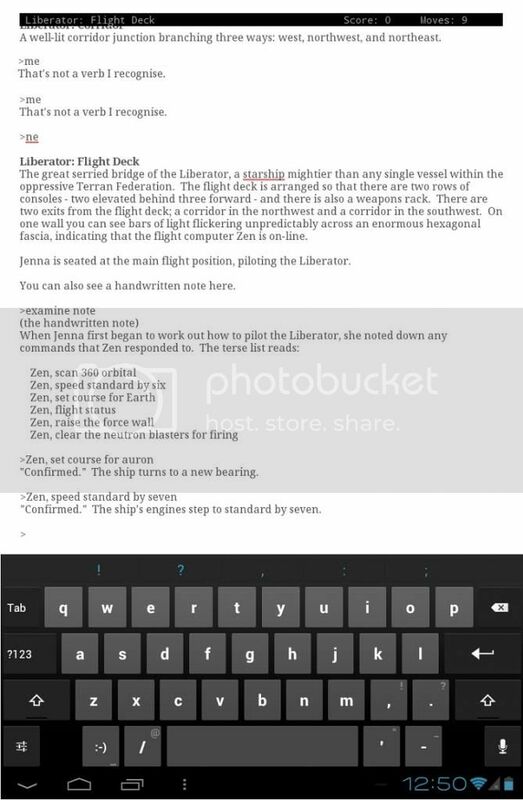 It's possible that you could play it through a web browser (like this suggests: http://www.instructables.com/id/Installing-Zork-and-the-zmachine-on-your-web-serve/), and that could provide a workaround for the Kindle. That said there are certainly several choices for PC. I prefer Gargoyle (and I'll provide a link for that too). I also prefer using the PC because even though it's also fun to play on a tablet, I get munged by the predictive text. P.S. I still have my original C64 copy of Infocom's HHG game. I had to save up to buy it, then save up to buy a disk drive to play it with! Later, Douglas Adams signed it for me when he was touring to promote "Starship Titanic". Text Fiction avoids some of the predictive text problems by allowing you to press on words in the descriptions to make them appear on the command line. 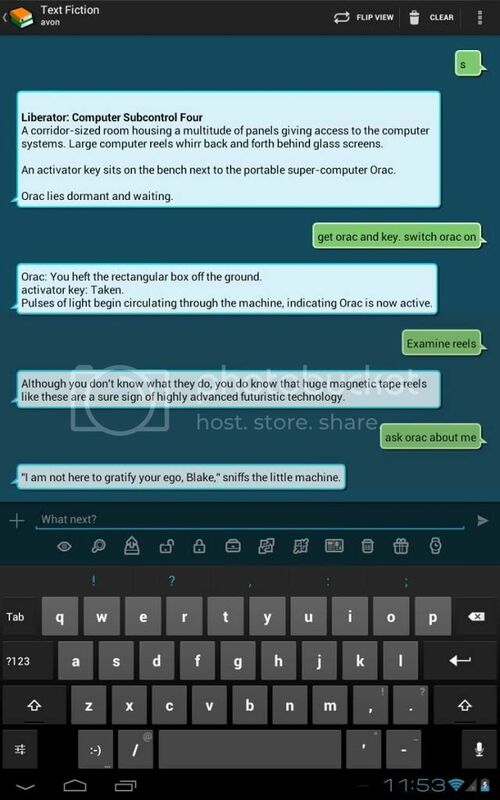 It also has a row of icons (above the keyboard in the screenshot) covering certain standard actions - Look, Examine, Open, Close, Get, Give, Wait etc. Directions are also underlined in descriptions so again you can easily tap on "northeast" in the text to have it pop up on the command line. I've saved the game file in a zip archive, "B7_Snare.zip". This is a very small file (~153k). To play the game you need the game file (B7_Snare.z8) and a z-file interpreter to run it. I like Gargoyle, which can be downloaded here: http://code.googl...loads/list. The file is about 4Mb in size. Once Gargoyle is associated with the Z8 file, you can simply click on the "B7-Snare.z8" file and it will launch the game. The site above also has Linux and Mac versions of Gargoyle, so if you want to play "Snare" on one of those machines, grab the right interpreter here. If you want to play "Snare" on an Android tablet, you need to download a free app like ZMPP Free or Text Fiction, and copy "B7_Snare.z8" to your tablet. You start off playing Avon on the day of the bank fraud, but once you get to Liberator you play as Blake. I know how to get to the Liberator part so if you get stuck I can give you a hint. I suggest you try to GO EAST (you can just type E if you like), then check your inventory (INV or I). As usual with these games, it's always good to draw a map and to EXAMINE things. You can SAVE your progress and RESTORE it, and TRANSCRIPT will save everything that appears on screen to a text file. When you see "MORE" on screen, hitting ENTER will advance you one line at a time and SPACE fast forwards to the next lot of text to read. VERBOSE repeats the room description every time you revisit a location, which helps you keep tabs of where you are and where other things are too. Many thanks Joe Dredd. Your going to laugh at this and maybe it will end up earning me some sad points but hey I'm a Blakes 7 fan first and proud of it. Not far from reach sits some sensational new games to play but you know what I never seem to find the time to even crack the box. However I download this new(well it's new for me) Blakes 7 game and I'm already diving in to check it out. Lol. I'm betting even a Blakes 7 text adventure game will be far more rewarding to me than all of these CGI extravaganza's put together. PS. Thanks for the other bonus B7 game sneak peak as well. Here's hoping it's not too much of a spoiler but beginning a game as Avon and then if you have a look(just type 'look at building' , seeing the Federation Banking Cartel right before you, is pretty darn awesome to say the least. (Big Finish dramatic music plays in my head as I play this text adventure). This is bringing back a lot of memories. Great stuff. WAY TO GO ANDREW WILLIAMS. What a great way to give a version of the story before the events in 'The Way Back'. WOW, you got to meet Douglas. That must have been a terrific day. Did your copy of HHGTTG come with a Babel fish? The version I obtained was just a disk but it was said there was a deluxe version with a flashy box and a babel fish inside? One more important command I should've mentioned is VERBOSE. This prints the location description every time you enter a location, even if you've been there before. I find this much more helpful than just seeing the name of the location on repeat visits. It's probably just because of my bad... er, my bad... my bad wossername. "Avon Alone" was created in the USA by Bernard J. Miller Jr., with graphics by Janet Wells. I was saving this in case I needed it for the Advent thread, but here are the moves to get to the Liberator (in 'Snare'). I think a timer starts once you run the bank fraud program. After that point you seem to end up on the Liberator no matter whether you get out of the office again or not. I also think it must be possible to beat the dealer selling the exit visas as I keep ending up at the spaceport but without enough time to do anything.